We all worship our cats, but there isn’t much worse than coming home to the distinctive smell of a recently used litter box. You may not even be aware that there are cat litters for odor control that can really make a huge difference in litter box smell. Thankfully, there are plenty of litter options out there today that specialize in containing and eliminating these odors, so you don’t have to face any nasty smells the second you walk in the door. We found Ever Clean Extra Strength to be the best cat litter at controlling odor and locking in urine. With that said, let us take a look at some of the other options and where we rate them, from best to worst. 9 Is Scented Cat Litter better than Unscented? Just as humans have different preferences and comforts, so do cats. Each cat is likely to prefer a different litter, there’s no objective “best litter” so to speak. While odor control is your main focus, it’s import to get the best fit for both yourself and your cat. You don’t have to break the bank to get some fancy litter that promises the world, the products below are all within a reasonable price range, with some even qualifying as fairly cheap cat litter. 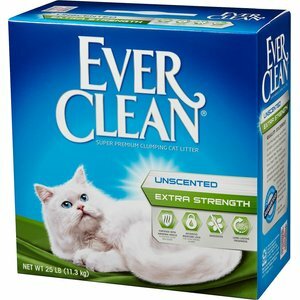 Here’s a list of the best cat litters for controlling odor with value for money and ease of cleaning taken into consideration. We’ve ranked Even Clean Extra Strength as the number one litter product for containing odors. Let’s talk about how we’ve come to that decision. Ever Clean have employed a mix of activated carbon and antimicrobial agents that promise to make smelly litter boxes a thing of the past. We think they’re pretty close to having it well and truly solved. It’s so good at it, that we had to keep walking to check if the litter had been used or not. Usually we’d be able to smell it a mile off! It’s unscented, which, depending on your preference; is both a pro and a con. In this instance, we think it’s a pro, since the odor fighting ability of the litter removes the need for the faint perfume smell that’s present in other litters. In any case, perfumed cat litter still smells very distinctly like cat litter, so scented isn’t an attribute that we rank very highly anyway. While this isn’t the focus of this article, we have to say that the clumping mechanism is fairly impressive and is one of the best we’ve seen in odor control litters. Especially given that it isn’t particularly marketed as being an industry leader in that sense. It also has the huge benefit of having almost no visible dust present. Many litters that are designed to combat one aspect of litter concerns often fall short in other areas. Not here. In summary, we find it very hard to see how anyone could be disappointed by this litter if they’ve bought it with odor control in mind. It excels at locking in smells for hours at a time and is definitely one of the best all round quality litters we’ve ever had the pleasure of using. If we could give this 6 stars, we would, but we promised ourselves we’d always stick to 5. Check out the other smashing reviews using the button above. Arm & Hammer are a very well known brand who’ve made good use of their world famous baking soda to create a litter that’s extremely effective at locking in and eliminating odors. Their baking soda formula is patented, so it’s a mechanism you won’t be able to find anywhere else. They promise it eliminates odors on contact, giving them no chance to spread and take over your home. Clearly they’re also very confident it’s one of the best available cat litters for odor. It comes with Arm & Hammer’s 7-day odor free home guarantee, so if you aren’t totally satisfied with it you’ll be able to get your full purchase price refunded. It’s a no brainer! It has a very light scent that isn’t overpowering as with cheap perfumed cat litters. It’s something that fits in well alongside the superb odor locking capability. 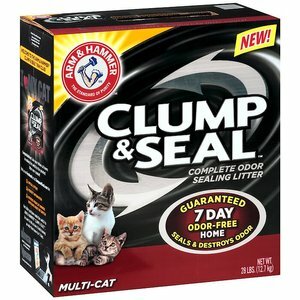 We also reviewed this cat litter recently over on our post about the best clumping litters available and rated it as the absolute best in that category. The clumping action is really second to none in our opinion. Coupled with it’s 100% dust free rating (which is definitely lives up to!) it’s the perfect choice for a modest price tag. No clouds of dust when scooping up, and no loss of litter to crumbling in the box. >We didn’t have a chance to test it with multiple cats, but it’s marketed as being able to cope with that. From seeing how effective it is with one cat, we’re inclined trust them. All in all, Arm & Hammer have produced a top quality cat litter than effortlessly removes nasty odors upon contact, preventing them from spreading through your home. With the 7 day guarantee, it’s a no risk purchase and you may find that you never look back. 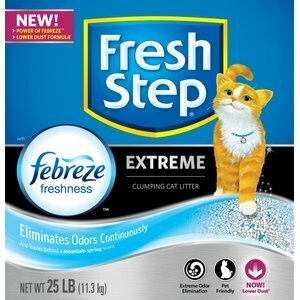 Fresh Step Extreme Clumping Cat Litter is the third and final 5 star car litter on our list. 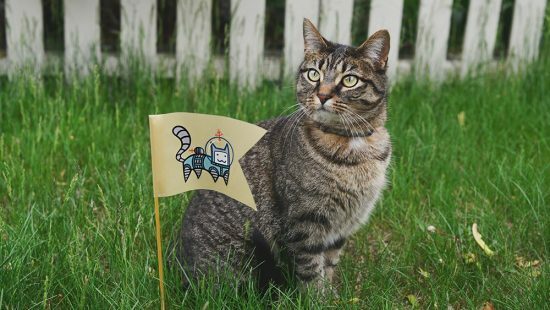 Partnered with Febreeze, they have the unique ability to bring a household air freshness brand name to the cat litter scene. Boy, oh boy does it make a difference. Most reviews we’ve seen say that this is the hands-down best smelling cat litter available. We think they might be right. Febreeze have a wide arsenal of fantastic smelling odor eliminating tactics and they’ve clearly employed their tricks very well with this litter. They guarantee that their litter will inhibit bacterial growth for up to a staggering 10 days, keeping nasty odors at bay and your home smelling fresh. The “paw-activated” fragrance feature means that every time your cat or kitten rustles up the litter, a fresh wave of odor fighting Febreeze is released, ready to mask the imminent smell! We had a little concern that the power of a standalone air freshener might make the scent of litter a little overpowering for cats, but we saw no such issues. Very pleased in that sense. It clumps very well for an odor fighting litter, though the clumps are not quite as solid and robust as those produced by Ever Clean and Arm & Hammer. We can’t really hold that against it since the level of freshness is definitely unrivaled. Dust-wise, it performs well. Dust is kept to a minimum when pouring and scooping. Again, it’s not quite to the same standard of the previously reviewed litters from the established names, but it’s respectable. 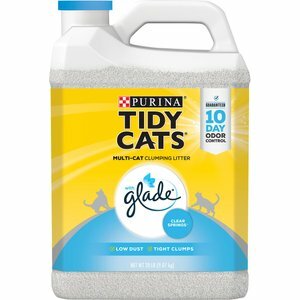 Many have reviewed this product with the opinion that it would be an industry leading cat litter if they got that last bit of dust under control. In our experience, the dust wasn’t really that bad, just about average for a clumping litter. Considering they’re rocking an established brand name and they’ve partnered up with another brand in the freshness business, it’s very modestly priced. It goes without saying that you get far more value for money if you buy the larger containers. In a similar pairing to Fresh Step & Febreeze, Purina & Glade have teamed up to tackle nasty litter odors as a duo! We could say much of the same about this product as with the last. The combination of a reliable pet product brand with a company who specialize in air freshness hits the mark and delivers reliable, thorough freshness to any litter box. It’s very, very good at masking odors. We’d put it on par with Fresh Step for the freshness of the scent, which is subtle enough not to be noticeable all day, but strong enough to cover up the nasty smells. The scent is a little more passive, in that the odor lingers around the box after you freshen the litter up, but that’s rarely an issue. We don’t tend to hang around the litter box much! We did notice a slight tendency for clumped litter build up at the bottom if your cat passes a lot of urine. We’d recommend filling the tray with at least 2-3 inches of litter. That should allow the litter to clump and seal in the liquid before it reached the bottom. It does extremely well in the dust department, there’s almost none to be found aside from residue in the bottom of the box when cleaning it out. We’ve dropped this half a star because it doesn’t clump quite as well as the best 5 star cat litters on our list. In all fairness, that’s testament to how well rounded the others are, rather than a fault with this one. It performs extremely well as an odor eliminating cat litter, manages dust brilliantly but falls a tiny little bit short with the average clumping action. A more than viable alternative to Fresh Step if you (or your cat) prefer this scent, you won’t be disappointed. 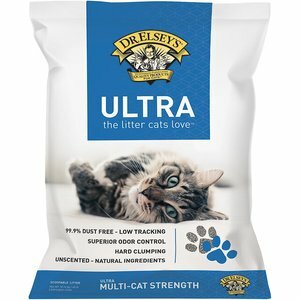 Dr Elsey’s Cat Ultra Premium also got a mention in our best clumping litter review. We’ve placed it here for similar merits, namely it’s all natural approach to the ingredients. That said, it’s surprisingly effective as a powerful odor protection option. It’s hypoallergenic, meaning it’s suitable for even the most sensitive of cats. There’s no irritation or offensive scent, so it’s probably one of the easiest litters around to transition your cat onto. A huge benefit for those who have particularly fussy little cats! Containing absolutely no perfumes or deodorants, you’re entirely reliant on it’s clumping mechanism to lock in odors and stop them spilling out into the air for hours on end. Thankfully, it does this pretty well. We won’t claim it’s the best at masking odors, because it isn’t. In fact, there’s a noticeable difference between the odor eliminating qualities of this when compared to the others in this list. We have to forgive it it’s short comings due to it’s natural approach though. 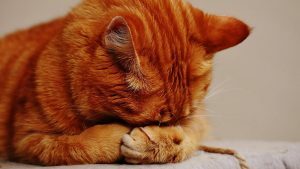 Many cat owners are keen to move away from chemicals and plant proteins that have been rumored to be harmful to their precious feline friend. So this is a great alternative, and the best natural cat litter around for odor protection. While we mention harmful proteins and chemicals, it’s important to note that no respected manufacturer would include any chemicals that have been proven harmful to cats in their products. The biggest complaint about this litter is that it can be hard to come by. It’s popularity amongst those striving for a natural approach to cat ownership the means that it’s often hard to find stocked. We can’t guarantee the retailer below will have it stocked, but there are usually plenty of buying options available which you can find by clicking the button above. Aside from using one of the odor battling cat litters we’ve listed above, there are other options that are worth investigating. Some of these tips are worth reading even if you do opt to buy a cat litter with odor defense built it. Litter boxes aren’t the most attractive looking things to have hanging around your house, so the temptation to tuck them away in some barely visited room is always present. That’s not a great idea, and your cat won’t thank you for it either. Place litter boxes in a well ventilated area that preferably offers your cat some privacy. A room with a window that you can leave open on a vent is ideal. This will help the smell disperse quickly, so that it doesn’t all hit you at once when you walk in that room after your cat has done their business. 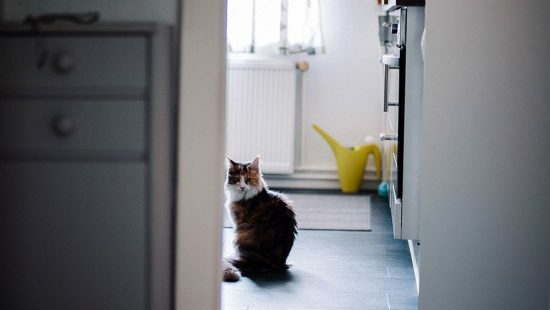 While a few of the odor fighting cat litters reviewed above have built in freshness mechanisms, you can bolster this by looking at a few other options. Plug in air fresheners are one of the best choices, since they’re passive and usually very inexpensive. They’ll also come with different refill bottles that will allow you to change the scent up every few weeks. The strength of the scent can differ hugely between models/refills. If you think the scent is a little on the strong side it’s best to place it slightly away from the litter box as not to deter your cat from visiting. 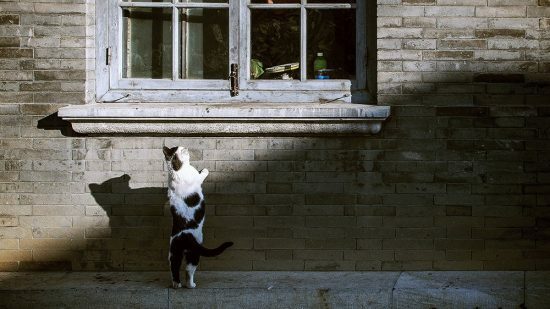 Cats use their scent to mark their territory, so you don’t want to be overpowering them with fragrance else they may turn their nose up at the box. Another option is to look at cat litter deodorizers. These usually come in either powder or spray form and can be applied to any litter to aid in odor elimination. 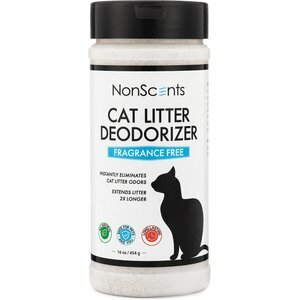 We’ve heard good things about NonScents Cat Litter Deoderizer which is best applied by mixing it in with the litter rather than sprinkling it on top. You probably won’t need to use this alongside any of the odor proof cat litters above, but it can be a low budget way of turning your existing cat litter into one that prevents odors escaping. It may be best to experiment with different fragrances and odor eliminators. Many find that air fresheners with a sweet scent can often make the already strong smell of urine even more apparent, but a lot of it is down to personal preference. Find what works best for you. You should strive to clean a litter box as often as you can. Scoop any solids out as quickly as possible. This gives you the best chance of beating nasty odors as they won’t have time to spread throughout the space in which your litter box is located. If you’re using a clumping cat litter, it should be easy to tell when a litter box has been used. Find a balance between cleanliness and waste. Ideally you should clean out the tray and replace the litter in the box twice a week, but many find that this often leads to you wasting a lot of litter. A week is the absolute longest you should leave between cleaning out the litter box. When cleaning out, remove all litter and scrub the box with soap and warm water. If you’re having a hard time removing the ammonia smell, consider using an odor removing spray. We had the best results using this spray from Rocco & Roxie. It works to dissolve any stains and odors leaving you with a clean smelling litter tray ready to fill. It’s totally safe to use around children and pets, so there aren’t any health concerns. A surprising amount of people don’t put enough litter in the tray. We assume this is down to them not wanting to waste litter when they have to throw it all out and re-fill. If you want the best protection against litter box odor, you should be filling with a minimum of 2-3 inches of litter. This is especially important with clumping litters, as it ensures all liquids are captured and locked in before they reach the bottom of the tray. Odor protecting litters can’t work if they can’t capture the liquid in time to lock it in. A last resort for those who just can’t beat the odor, or for those who can’t commit to cleaning out their litter box regularly enough. Litter boxes that clean themselves are costly, but they do work. They’re not always perfect, but purchasing one of the best models will make your life a fair bit easier. They usually feature counters that show you how often the box has been used, and a closed waste compartment to stop smells escaping once cleaned. It’s up to you if think it’s a worthwhile investment or not. The best odor defense cat litters usually need to abide by the same standards as any other litter. You want a product that controls urine the way you expect, in most cases by clumping. A majority of odor control litters feature a clumping mechanism because it’s the best way to lock in smells on contact. Many litters have different clumping mechanisms, but most make use of bentonite clay, something that can be harmful to kittens if consumed. Be careful using clumping litter with very young cats. Some litters clump better than others, and since clumping plays an important part in protecting from odors, you should prioritize picking a litter with excellent clumping ability. Above all else though, you’re looking to eliminate smells. The two best odor free cat litters on our list above make use of activated carbon and baking soda respectively to cancel out smells on contact. Both are very different but equally effective. Arm & Hammer’s litter with baking soda is a patented formula, so if you find that works best then you’re unlikely to find it anywhere else. Since we’ve not seen any other mechanism work quite as well, we’d recommend looking for litters that use either of those mechanisms. Is Scented Cat Litter better than Unscented? Scented vs unscented cat litter is a popular debate in the cat owner community. In truth, it comes entirely down to personal preference. You should definitely check that you choose a litter your cat agrees with. Since you can’t exactly ask your cat and expect a reply, it’s probably best to make sure they’re happy using it by checking for any signs of irregular use. Irregular use can be anything from sniffing at the litter box with intent and then walking away, to missing the litter box deliberately. Even some of the best odor preventing cat litters are available in both scented and unscented, so take a look to see if there’s a similar product out there if you aren’t happy with your current litter.